I read that tweet to mean, “Since God is unable or unwilling to protect us, why should we pray to Him?” Here is a radical thought: we should acknowledge and honor God all the time–and not just when a disaster hits. We would label adults ungrateful if the only time they call their parents is when they want something. It is also very ungrateful to ignore the Lord who made us and who died to pay for our sins until that moment comes when we need something. God is holy and glorious. That is why we should never treat Him like our cosmic servant. We exist to honor and serve Him, not the other way around. “Serve the Lord with gladness; Come before Him with joyful singing” (Psalm 100:2). “For you have been bought with a price: therefore, glorify God in your body” (1 Corinthians 6:20). This is what the unrighteous are like, “even though they knew [about] God, they did not honor Him as God or give thanks, but they became futile in their speculations, and their foolish heart was darkened. Professing to be wise, they became fools” (Romans 1:21–22). We don’t want to be foolish, as that comment about prayer being ineffective clearly was. Shouldn’t disaster remind us to love and honor God all the time? We should honor Him, and praying is one way we can do that. Although we should always be praying, when something terrible happens, we do hear people talk more about appealing to God. At this time, in light of politicians who publicly disrespect the act of praying, we should turn our eyes to Jesus. 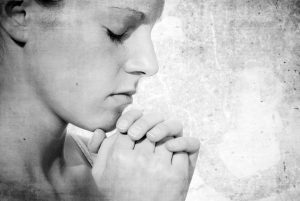 What can we learn about praying from Jesus Christ? Jesus not only taught about prayer, but He also showed the importance of prayer by the way He lived. Did you know that Jesus prayed a lot and that He often prayed for long periods of time? See Mark 1:35 as an example. Even with all that praying, Jesus was ridiculed, lied about, hated, and eventually executed. If the many hours Jesus spent praying didn’t even keep Him safe, then why did He spend all that time doing it? It certainly wasn’t because He lacked power or authority. After all, Jesus “is the image of the invisible God, the firstborn [or the preeminent One] of all creation. For by Him all things were created, both in the heavens and on earth, visible and invisible, whether thrones or dominions or rulers or authorities—all things have been created through Him and for Him. He is before all things, and in Him all things hold together” (Colossians 1:15–17). The answer is found in the intimate bond between the members of the Trinity. We know this because when Jesus was talking to His Father, He said, “…You have loved Me” (John 17:23). Later He said, “O righteous Father, although the world has not known You, yet I have known You…” (John 17:25). They were close, really close! Jesus didn’t just pray when He was in trouble. He prayed because He loved the One He was praying to. In other words, Jesus spent intimate prayer time with the Father because they loved each other. That is an example we should follow. We all like spending time with the ones we really care about, don’t we? We need to have God’s perspective on this broken world that is so full of pain and disappointments. Prayer, spending time talking and listening to Him, helps us do that. We must compare our temporary troubles now to the long ages of eternity because “… the sufferings of this present time are not worthy to be compared with the glory that is to be revealed to us” (Romans 8:18). Every heartache here is not only temporary, but it also gives God an opportunity to send His powerful help in the midst of suffering to those have given their hearts to Jesus. When the Apostle Paul was enduring a painful physical trial, the Lord encouraged him with these words: “… My grace is sufficient for you, for power is perfected in weakness” … (2 Corinthians 12:9). God’s peace and presence was so real and comforting to Paul that he became “… well content with weaknesses, with insults, with distresses, with persecutions, with difficulties, for Christ’s sake; for when I am weak, then I am strong” (2 Corinthians 12:10). More important than our own safety (having our pews safe) is knowing that Jesus is our “… friend who sticks closer than a brother” (Proverbs 18:24). Those who are trusting in Him know that their eternity is forever secure and nothing “… will be able to separate us from the love of God, which is in Christ Jesus our Lord” (Romans 8:39).